Don’t limit your self to just Alfredo or pasta and cheese. 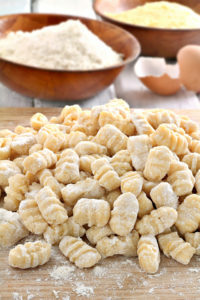 There are so many Italian dishes out there that are amazing and is worth a try. 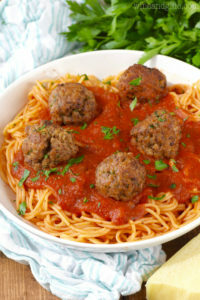 Spaghetti and Meatballs are traditionally what many eat as a basic Italian dish. You may think that it’s just meatballs, but if you had the right recipe for your meatballs then you would think otherwise. If you have never tried an Italian Pizza then boy you are missing out. 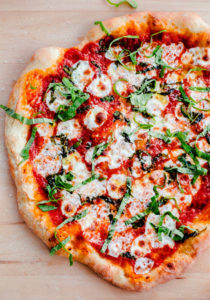 I love my Margherita Pizza with basil, truffles and prosciutto. The “death bread” this is the bread that I will die for. 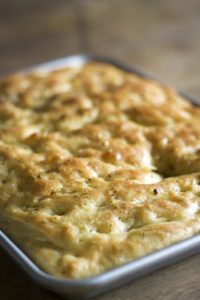 Yes, I’m serious focaccia with a side of pecorino and olive oil is just phenomenal. 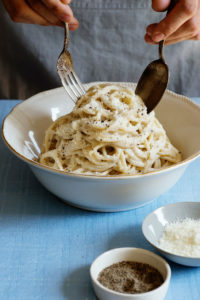 Cacio e Pepe which means Cheese and Pepper is a classic Italian dish with simple ingredients that includes black pepper, Pecorino Romano, cheese and pasta. Made with potato, cheese and a whole list of goodies, This soft dough dumpling is everyone’s favourite Italian dish. Gnocchi in red sauce with a couple meatballs is fantasy hahaha. I love it!!!! 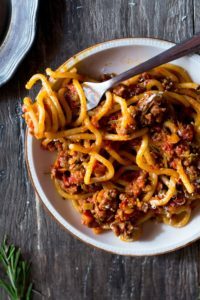 Made with Italian sausage, ragu and pici this dish looks absolutely delish. How can you go wrong? Inside the rustic kitchen has the recipe for you to try. 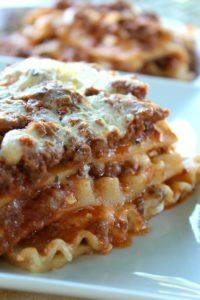 Who doesn’t love lasagna? Well this lasagna is filled with mozzarella, cottage and parmesan cheese. Scrumptious!!! Everyone has their version of Carbonara but I do love this recipe from “Damn Delicious”. 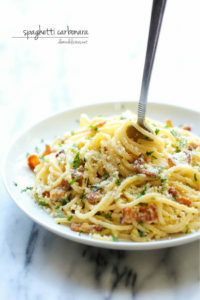 With only 5 ingredients this Spaghetti Carbonara is an easy to do when starvation kicks in. I know I have a another dish with ragu, but trust me this is worth it. 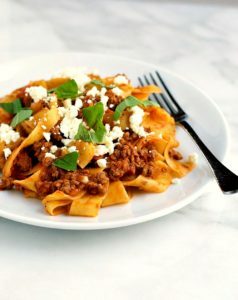 Lamb in ragu cooked in pappardelle with feta cheese on top. 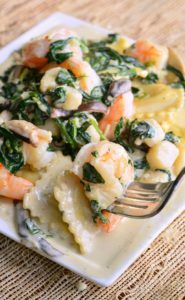 While I made Seafood Ravoli which was absolutely amazing, I can’t even begin to fathom it with Spinach and mushrooms in Garlic Creamy Sauce. 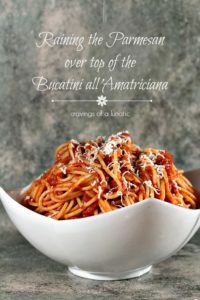 “Bucatini All’Amatriciana” in my italian voice. 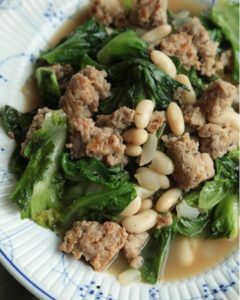 While this may not be one my favorite dish. This seem to be crowd pleaser. Cravings of a Lunatic made this bucatina with pancetta which is like bacon, others use veal or lamb. This dish is pretty versatile so you switch it up yo suit your needs. I love beans and sausage. Add escrole and some cheese to that. Bon Appetit. 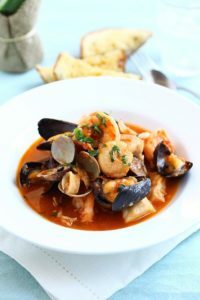 Cioppino known as fisherman’s stew, is a very famous Italiam-American dish which consist of seafood in a nice stew. 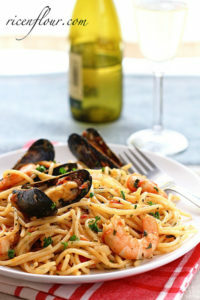 If your seafood lover like myself you will definitely love this one. 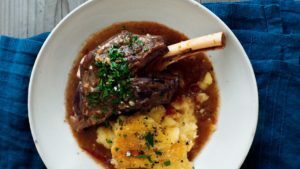 Lamb shank with backed polenta, this may not be classic Italian but its infusion will is Italian enough for me. Which one of these dishes are you gonna try? Let me know in the comment box below. I honestly want to try every one of these. Thank you for sharing!